While I was playing Guitar Hero, Harley Quinn was bouncing on top of his cage, talking and trying to get my attention. It turns out he just wanted to play, too. 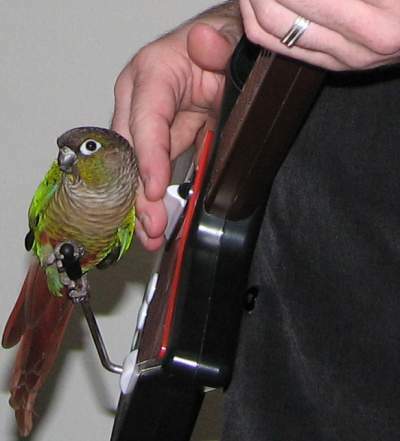 Here he is loosening up the whammy bar for me. It's not a joke. He really likes watching the game. Depending on the song, he really starts revving up, bouncing a bunch. 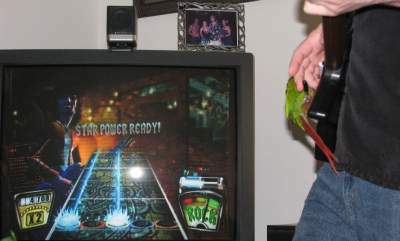 If you've played the game, you know you fiddle with the whammy bar to increase your score more quickly. I was whammy-ing here for the heck of it, because the Star Power wasn't active, yet. And this is the Star Power whammy bar action. 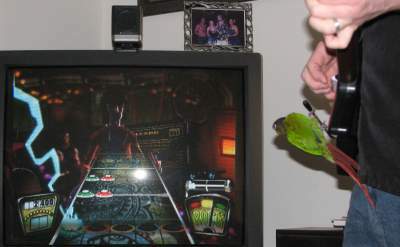 It's hard to tell in a still picture, but I was using the whammy bar and he was just enjoying the ride.